Please Choose: Necklace or Key Tag? Fun, colorful, and customizable in nearly ANY way you wish! 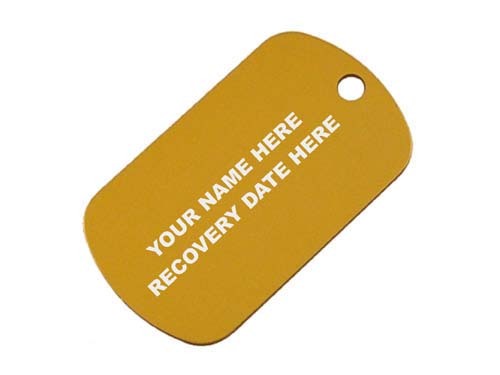 Show your pride, dedication and positive outlook with our attractive laser engraved, anodized aluminum recovery dog tags! The classic symbol is expertly laser engraved onto the front side while the reverse side gets personalized with your name and recovery date! Choose from an attractive necklace or a practical key tag -- or, what the heck? Get one of each! Simply choose from the pull down box above! Dimensions: Main body is approx. 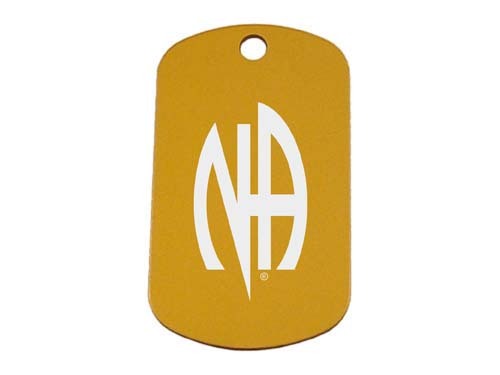 1.96" x 1.14"
Would you like to have your special message, art, or logo on a dog tag? We are always happy to accommodate requests for special customization and personalization projects! Please contact us anytime for details on our personalization services. You'll be amazed at just how easy and affordable it is!